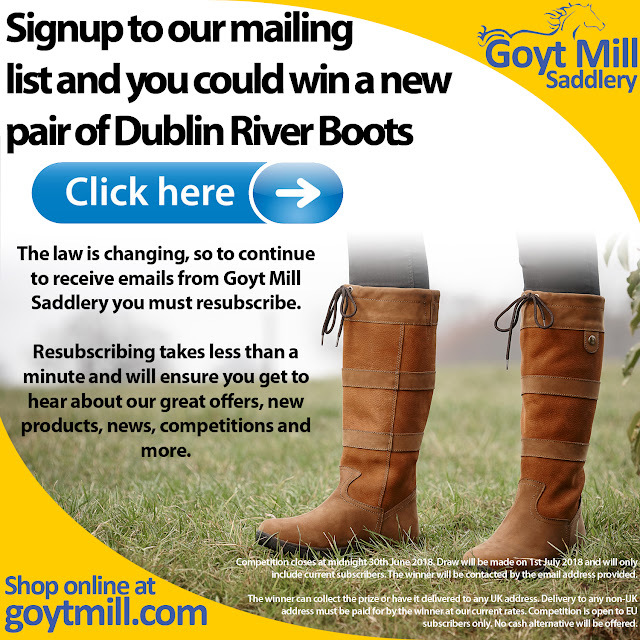 The law is changing, so to continue to receive emails from Goyt Mill Saddlery you must resubscribe. Resubscribing takes less than a minute and will ensure you get to hear about our great offers, new products, news, competitions and more. Competition closes at midnight 30th June 2018. Draw will be made on 1st July 2018 and will only include current subscribers. The winner will be contacted by the email address provided. The winner can collect the prize or have it delivered to any UK address. Delivery to any non-UK address must be paid for by the winner at our current rates. Competition is open to EU subscribers only. No cash alternative will be offered.